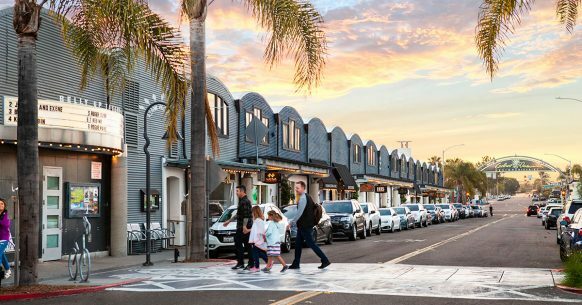 Just a stone’s throw from the coast in Solana Beach and running parallel with Highway 101, this North Coastal shopping district features more than 85 stores. It’s known as the epicenter for renowned architects and interior design firms. From breakfast to late-night music venues, art, furniture, cute cafes, and stylish hair salons, Cedros Avenue Design District is the perfect destination for a day of ocean-adjacent strolling, shopping, and relaxing. And, the Coaster station in Solana Beach is a block away, so getting there is half the fun! Thanks to this live music venue, Cedros Avenue is rocking well after dark with talent from near and far. The adjoined Wild Note Café, serving a full-menu including lobster dumplings, truffle fries, and Dijon-herb crusted salmon, will make sure you’re fortified to dance the night away. Natural coastal tones and fabrics characterize the aesthetic of this coastal chic home décor and gift store, housed in a cottage dating to the 1920s—the very first one built on the avenue. Visit to stock up on trendy pillows, bedding, rugs, furniture, and accessories. No San Diego neighborhood would be complete without a brewery and tasting room, and to that end Cedros Avenue has Culture Brewing, an indoor-outdoor brew house that pairs with local food trucks to bring craft pizza, tacos, poke, and other eats to you. Whether you’re in need of a fresh-squeezed juice, coffee, sandwich, salad, or salmon plate, this café can fuel your outing on Cedros Avenue. Many a shopper has powered up on the housemade walnut butter or lavender iced latte at this cute, breakfast-oriented cafe. Do you know where your olive oil comes from? You will if you get it from Temecula Olive Oil’s family-owned ranch in San Diego County. At the shop and complimentary tasting room on Cedros Avenue, you can sample cold-pressed, extra-virgin oils, and balsamic vinegar, plus peruse other items like olive-based soap, cookbooks, and olive wood gifts. Every Sunday, Cedros Avenue plays host to one of North County’s biggest farmers’ markets, packed with stalls from organic and locally certified farmers, plus crafts, and an open-air food court chock full of fruits, vegetables, meat, bread, pastries, and more to fill your belly and shopping bags. World renowned surf photographer Aaron Chang captures the essence of San Diego in ocean-themed large format photographic prints and surfboards. A former senior photographer at Surfer magazine for two-and-a-half decades, Chang has more recently taken up sculpture, an interest reflected in oversized eco-friendly surfboards and other projects evoking the ocean. This entry was posted in Neighborhoods and tagged entertainment, north coastal by San Diego Magazine. Bookmark the permalink.